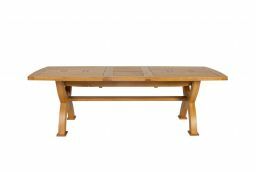 Monastery 300cm Large Solid Oak Double Extending Dining Table. 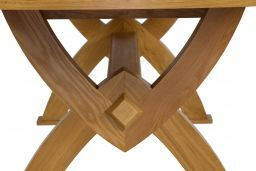 ( 3 table sizes in 1 stunning design !) Made from 100% solid American oak. 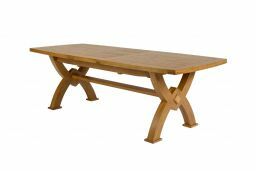 Made exclusively for Top Furniture Ltd from sustainable plantation oak sourced from American forests with a hard wearing oiled wax finish. 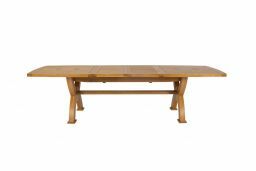 A very chunky solid oak dining table design with two extensions stored below the middle of the table top that means the table can be extended from a closed 2.0m long table to a 2.5m table with one extension in use or up to a huge 3.0m length with both extensions in use. Simple and easy to extend within a couple of minutes. 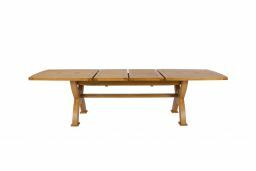 You can choose to use the table in either 200cm, 250cm or 300cm lengths depending on the number you wish to seat on different occasions. When not in use you can close it down to the compact 200cm length to save space in a dining room or kitchen. 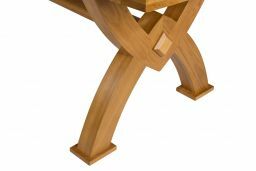 The eye catching X leg design means that there is no lost space around the edge of the table for seating dining guests. 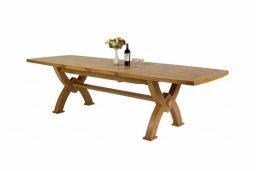 You don't have the traditional 4 table legs getting in the way of peoples legs that you find on most dining tables which usually means that someone has to sit either side of a leg when trying to seat lots of people on Christmas day. Seat people along the full length of the Monastry table with no lost seating space. 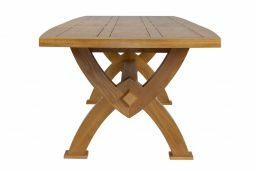 Mix and match this table with any of our dining chairs to make your own dining set combination. 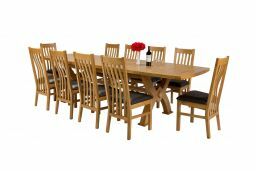 Seats 10 - 12 people very comfortably and shown in some photo's with the Chelsea chairs in a great looking set combinations that we offer. 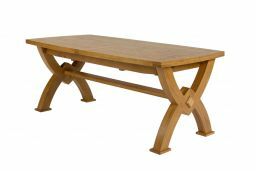 View more large oak table designs here. Lovely table, delivered and assembled with cheerful efficiency by Drew and Gareth, for whom nothing was too much trouble. They even took away all the protective packaging! 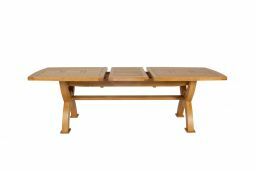 Table looks great in our modern kitchen/diner and will be invaluable at large family gatherings. As a large Fostering family we know the importance of big family meals and essential to this is a big family dinner table! 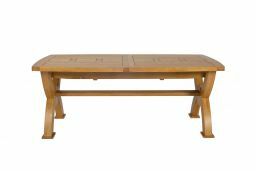 Our new extending monastery table fits the bill perfectly. 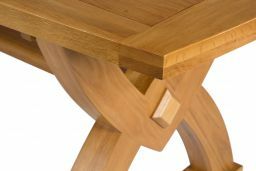 The flexibility of a variety of size options is great and the build and design quality simply beautiful. 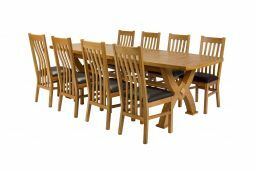 With accompanying chairs built for comfort and style we are so pleased with our new dining set which will be the centre of Foster family life for many years, and many children, to come. great design and construction at a reasonable price. 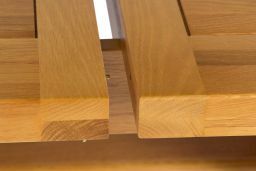 An excellent high quality table. Top moves smoothly to access the extension leaves. The oak matches our extension room beautifully. Assembling the table is easy, but turning it over after that is extremely heavy - we needed 4 people, then it was fine. Very nice table, solid build quality, delivered on time and within 10 days of the order. Excellent table that can be extended from 2 meters to 2.5 meters and 3 meters. Solid quality. Looks beautiful in me living diner. very easy to assemble (2 people required) due to its weight. The furniture is great. Exactly what was described and well worth the money. If there was any criticism at all it is minor, and is that it took some finding on the web pages. Updates and delivery time was great, nd plenty of delivery time warning helped me to be there to collect.